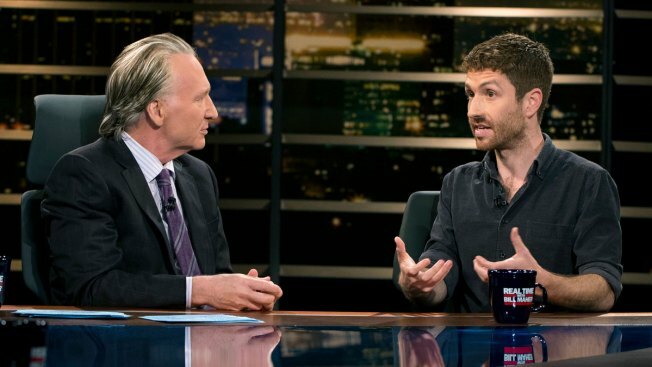 In this photo provided by HBO, Bill Maher, left, is shown during a segment of his "Real Time with Bill Maher," Friday, June 2, 2017. Bill Maher apologized Saturday for using of a racial slur to describe himself as a house slave during a live segment for his HBO talk show. Maher's comment during his discussion with Sen. Ben Sasse, R-Nebraska, was quickly and broadly criticized after it aired on the comedian's "Real Time with Bill Maher" show Friday night. HBO said the remark was "completely inexcusable and tasteless" and the segment would not be re-aired. "Friday nights are always my worst night of sleep because I'm up reflecting on the things I should or shouldn't have said on my live show," Maher said in a statement Saturday. "Last night was a particularly long night as I regret the word I used in the banter of a live moment. The word was offensive and I regret saying it and am very sorry." During Maher's discussion with Sasse, the senator joked that he would like to have Maher visit Nebraska and work in the fields. The comedian responded by using a slur in a joke that he was a house slave. The comedian immediately waved off audience groans. "It's a joke," he said on the show. Activists including the Rev. Al Sharpton quickly criticized Maher, and it remained a top-ranked topic on Twitter on Saturday morning. Sasse wrote on Twitter on Saturday morning that he wished he'd challenged Maher for his use of the slur immediately. "I'm a 1st Amendment absolutist. Comedians get latitude to cross hard lines," Sasse wrote in a series of posts. "But free speech comes with a responsibility to speak up when folks use that word. Me just cringing last night wasn't good enough. Here's what I wish I'd been quick enough to say in the moment: 'Hold up, why would you think it's OK to use that word?' "
Fellow TV host Larry King has tweeted in defense of Maher saying "I've been a friend of [Bill Maher] for years and there's not a racist bone in his body. Let's accept his apology and move on."